Legs are one of the areas that persistently holds on the extra fat, especially if you are a woman. Also, the lower part of our body is a big trouble spot for many people these days. Unhealthy lifestyle, Body type, Age, Genetics, hormone problems, etc. are the main causes of the fat stored in these areas. The unwanted fat rests on our hips and thighs thus giving us a pear shaped body. Due to the shape of our body, we restrict ourselves from wearing trendy clothes. If you are unable to emit that fat from your legs, then you must try to get to the root of the problem. So, to make your legs look slimmer, you have to lose fat all over the body. Don’t worry; there are many ways and exercises to reduce thigh fat. Just read on to know about How to reduce fat from Thighs at home. But before you set about trying to slim down your thighs, you need to confirm whether you have big leg muscles or a lot of thigh fat. If you have always had heavy legs, then they may be a bit stubborn to slim down. You may try the slim thigh test to prove yourselves. For this, Straighten your leg and tighten your thigh muscles. Now pinch the top layer of fat and skin of the thigh. If there is much to pinch then those thunder thighs are due to fat. If there is less to pinch then you were having large thigh muscles. But How to reduce fat from thighs ? 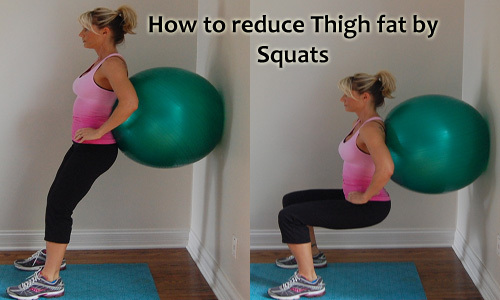 Dont’t worry; there are still some ways for reducing thigh fat. Here, in this article, I have mentioned some exercises that will help you to reduce fat from thighs and bring them back in a great shape. Exercises will tone the body and remove all the toxins through sweat. They are essential to eliminate the fat from the body. If you combine the following exercises and healthy lifestyle and do them at least three times a week, you will reduce fat from thighs. Squats are one of the best exercises for reducing the fat from your lower body. Since squats are a compound movement, you can burn a higher amount of calories by performing them. Remember, more calories you burn, the more fat you can lose from your legs and entire body. Also, doing these engage the large muscles of your lower body thereby helping you to increase your lean mass. To do this, lower your bum down to the ground against the wall with your legs at shoulder width, until your thighs are parallel with the ground. Balance in this position for at least three seconds before pushing up. You can try this squats with an exercise ball by placing the ball against the wall with your lower back firmly pressed against it. Stand tall with your feet somewhat wider than hip-width apart. Keeping your chest lifted and maintained a neutral spine, lower into a deep squat, reaching both arms to the floor. While you press up, substitute your weight into the right leg as you bend your left knee and grab onto your limb with your left hand. Hold for one count and then release your leg and finally return to start. It is one rep. You should do 20 reps total on alternate sides each time. Do Lunges make your Thighs thinner ? The lunge is one among the best moves you can do to work the leg muscles. Because doing lunges train your thighs, glutes, and hamstrings. When you lunge, you will not only strengthen and tone your legs but also improve your balance and gain core strength. To start this exercise, first of all, stand up straight with your feet hip-width apart. Now place your hands on the hips and pull your shoulders back and then look straight. Now, take a step forward with your right leg. Keeping your trunk straight and your weight on the heels. Ground your body until both your front and back legs form a 90-degree angle and your knees are directly over your ankles. Wait for few seconds in this position and bring your right leg backward to return to start. Repeat the same with the other leg. You can also try this by carrying a 5 or 8-pound dumbbell in each hand. You can burn thigh fat by doing these 4 simple exercises at home. These exercises not only helps you slim down your thighs and hips but also build the muscles in your legs, which are one among the largest and strongest muscles in your body. For these moves, you need only a sturdy chair, i.e., a chair without wheels. Better opt a chair without a hand rest. The seated pillow squeeze works on inner thighs. First of all, sit on a sturdy chair by resting your feet on the floor with knees bent at the 90-degrees angle. Now place a pillow or cushion between your thighs. Exhale as you squeeze the pillow between your thighs as if you were trying to press the stuffing out of the pillow. Now hold it for 1 minute as you breathe normally. Finally, release and proceed to further moves. It works on Outer thighs and hips. To do this move, sit on a chair and rest your feet on the floor with knees bent at 900 angles. Now place your palms outside of your knees. While keeping your palms and arms stable, you should push your knees outwards against your palms, as if you were trying to push them away. At the same time, press inward with your hands, preventing your thighs from pushing them outward. Hold this contraction for 1 minute by breathing normally. Now release and proceed to next move. The fronts of your thighs will be controlled by doing this move. Sit in the above mentioned position. Now rest your hands at your sides on the chair. Exhale as you lift and extend your right leg. Hold for about 30 seconds as you breathe normally. Then inhale as you release your right leg and exhale as you repeat with the left leg. Now hold for 30 seconds while breathing normally. Finally, release and continue to the following move. It works on the backs of the thighs and rear end. Place your palms at your sides on the chair. Exhale while you lift your hips by allowing your palms and feet to support your body weight. Proceed to lift your hips till your body matches the shape of a bridge. Hold for about 20 to 60 seconds while breathing normally. Release and return to the first one. Finally, repeat all the four moves once more. It is important to drink a sufficient amount of water for the whole day because our liver needs water to convert our fat into energy and keep the metabolism high. Doctors will recommend us to drink 8 to 10 glasses of filtered water daily. Also, you should start your day with a glass of water. 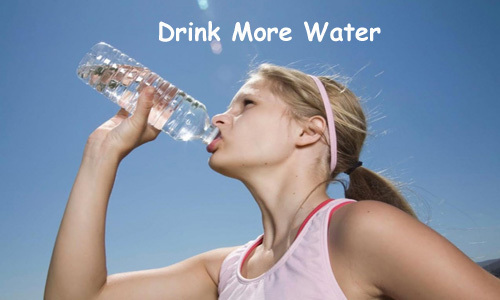 Choose water every time you reach for a drink and avoid sodas, energy drinks, concentrated juices, etc. because they may contain some tons of sugar which neutralize the whole workout. Instead, you may opt for natural sweeteners like honey. Maintaining a healthy diet is a primary factor in losing your weight and thereby getting a healthy and toned body. Better eat low calorie foods and restrict your daily intake between 1200 to 1500 calories. Since the excess of carbohydrates contributes to weight gain, follow a low-carbohydrate diet. Go for green tea because it contains 1-2 calories per liter. Better drink a glass of water or green tea before eating a meal as it lowers your cravings. Getting enough sleep is also proven to aid in weight loss. Sleepiness makes people snack more, while also making them too tired to work out. Running is especially effective for those who have big thigh muscles because it may reduce the size of the muscles and decrease fat around the muscle thereby making our thighs smaller. It will completely change the size of your thighs and legs. If you hesitate to run, you may go for walking. Depending on your weight and speed, you can burn upto 100-400 calories per hour while walking. Pump up the treadmill’s incline or find some hills to bike or run up or take the stairs outside or in your home. By getting high, you will instantly feel the increase in your heart rate which means you are working harder and burning more calories than if you were to stick to a flat surface. Climbing also targets your thighs and hamstrings thus toning your lower body. Play some sports such as Tennis or badminton or some other that burn calories quicker at the surroundings of your home. If there is no space available in your surroundings, better join a recreational or competitive league. Because playing a sport burn more calories than we are to give up when the workout becomes hard. 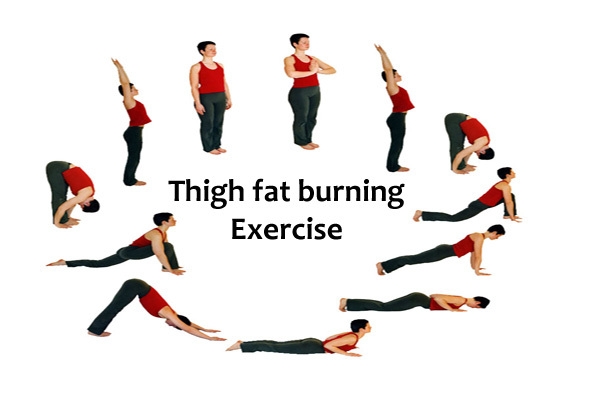 If you want to reduce fat from thighs naturally, you may try these yoga asanas at your home. Apart from reducing fat, yoga will increase strength and flexibility of our body and calm your mind. Better consult a yoga practitioner to learn about these postures. The Surya Namaskar also known as Sun Salutation is a well-known posture in yoga that helps in toning the entire body including hips and thighs. Practice Surya Namaskar at home twice daily for reducing thigh or leg fat. Also, you may try some other yoga poses such as Baddha Konasana, Setu Bandhasana, Utkatasana, Ananda Balasana, Veerabhadrasana, and Paschimottasana. Now, there is no need to spend some hours a day at the gym. 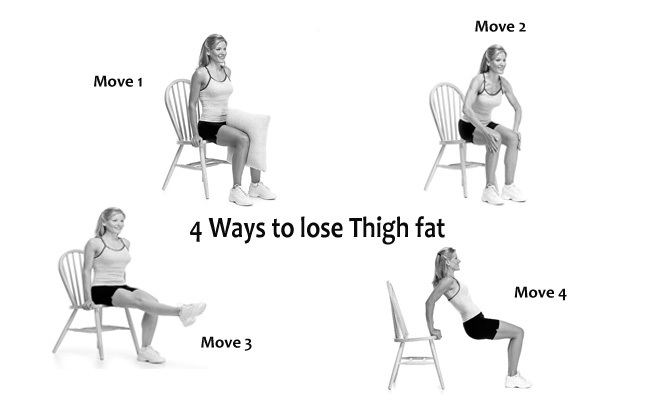 Hence, try these exercises at home and also maintain healthy lifestyle to reduce fat from thighs.